When it comes to spending time with family over good food, drink and company i’m always excited. Why? well since my childhood family time has always been important and spending time with extended family whom you only see a couple of times in the year brings a lot of joy. This year Christmas is at mum and dad’s and we have already made a list of what we should make especially for the vegetarians (including me) As you may have guessed I’m in charge of desserts and no matter what I say or plan I always make more than we could eat. Hey it is a day where all you do is eat, drink and have fun time with the family right? This year catering for an expecting sister, a diabetic but sweet tooth father and husband who has an allergy to nuts I’ve decided to go for a lighter dessert, a light textured layered cake infused with cinnamon spice and nutty flavours of chestnuts. The pears poached in mulled wine takes this cake to another level with the rich taste of full bodied of wine, sweet, aniseed scent with an earthy cinnamon flavour. 1. Preheat oven to 180 degree C or 160 degree for fan assisted. Grease and line an 8 inch round cake pan. 2. In your mixer cream margarine and sugar until creamy and well incorporated, add eggs one by one beating well between each addition. Beat in chestnut puree and milk. 3. Fold in flour and baking powder until all incorporated. 4. Pour batter into the prepared tin and bake in the oven for 50-55 minutes. Insert a skewer and it should come out clean. Leave to cool in tin for 5 minutes before transferring it out onto a wire rack to cool completely. 5. To make the poached pears, in a saucepan add the wine, sugar, cinnamon stick, star anise and gently lower in the pears. 6. Cover the pan and poach the pears for about 25-30 minutes. Pears should be tender all the way through. Once poached, remove the pears in a bowl, reduce the wine for a further 5 minutes and pour over the pears. Allow to cool. 7. For the icing, place all the ingredients into your mixer bowl and beat until creamy, ensure you scrape the sides of the bowl in between. Fit piping bag with round nozzle and fill with icing. 8. To assemble: slice the cake into three layers horizontally. Pipe buttercream between each layers. Top the final layer with butter cream, finish off with sliced poached pears and a dusting of cinnamon powder. You do not require to chill the cake in the fridge, store it in a cool dry place. Cake will last for 3 days at room temperature in an airtight container. Christmas spiced cranberry, orange and carrot Bundt. 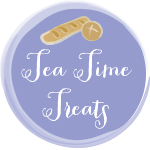 1.The Tea Time Treats challenge hosted by Karen at Lavender and Lovage and Janie at The Hedgecombers. This months theme is Sugar and Spice hosted by Karen. I love the cinnamon and chestnut flavours you have used in your cake – so inventive! I am not sure I have tried chestnut purée before but I remember loving the taste of roast chestnuts as a child so I must do so. The poached pears on top look just perfect, kept their shape and with that lovely hue. A cake worthy of a spot on a patissier’s shelf and thanks so much for joining in with Perfecting Patisserie! Ooh this sounds delicious. Like Lucy, I’ve never tried chestnut puree or buttercream before, but again love the sound of it especially if it’s akin to the roasted ones. We too are spending Christmas with my parents and are sharing with the making of the food. Like you, I’m in charge of the dessert! Thank you so much Angela for your lovely comment. Isn’t it fun sharing food with family and friends what are you making? Keep em coming Chintal! Another fabulous looking gateaux.